The following is a guest post from Julie Cevallos. She is the VP of Marketing for the National Down Syndrome Society and mother of Alec and Nina, who happens to have Down syndrome. October means a lot of things to a lot of people; crunchy leaves, apple cider, Major League Baseball playoffs, final Halloween costume decisions. But for those of us with a connection to Down syndrome, October takes on an added meaning. October is National Down Syndrome Awareness Month, which is the perfect time to inform our friends, our families and ourselves about Down syndrome and people who have it. People with Down syndrome have come a long way in recent years due to improved healthcare and inclusion in society. In 1983 the life expectancy for people with Down syndrome was 25. Today it is 60! People with Down syndrome are included in elementary school, high school and college. They hold jobs, maintain relationships and contribute to society in a number of ways. If you don’t know someone with Down syndrome you might not have heard this before. By reading this you are already doing your part to raise awareness this October. 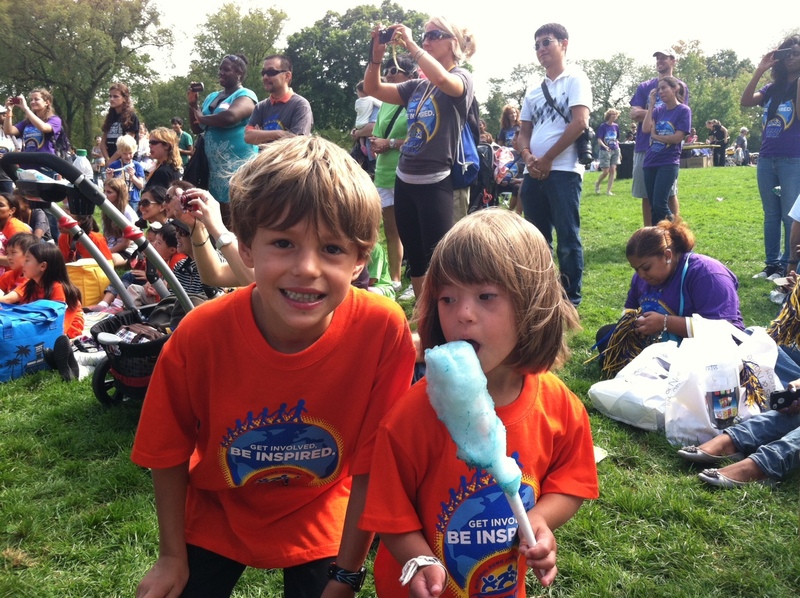 One thing my family did was our local Buddy Walk®, part of the National Down Syndrome Society’s national walk program. My daughter Nina, who has Down syndrome, is almost four years old and her older brother Alec was right by her side with his best friend Nate. The trio ends up together a lot. These seven-year-old boys could not be more caring and sweet to Nina. They fight to push her stroller; they celebrate when she says something new; they comment on her adorable clothes and how tall she looks now. Who knew these boys who love potty humor and already have formed cliques at school could be so sensitive! But they aren’t being sensitive, are they? They just love her, enjoy her, know she’s cute and love to celebrate her and teach her. And now there is an added dimension- they know she has a thing called Down syndrome. That’s ok too – it’s just an explanation of what they already know and see every day, part of who Nina is. Just a couple months ago, as Nina’s brother Alec was turning seven, he asked me, “What does 3:21 on our t-shirts mean anyway?” I answered something like, “Do you want the real scientific explanation? It’s because she has 3 copies of the 21st chromosome. You’ve heard us say she has Down syndrome, so this is what that means, that’s why she needs extra help and support and we’re so proud of her!” From that moment on it just clicked, and he used the word Down syndrome to describe people we know, and how she’s the best kid with Down syndrome ever – of course! I knew this year’s Buddy Walk would be so much more meaningful. That the medal he got at the end of the walk would be something he was very proud of because he knows that his sister has a disability and it doesn’t matter, and that we should explain that to other people so they can get it like he gets it – at age seven! There are lots of other ways to educate yourself and others and get involved this October. I invite you to join the celebration to promote the value, acceptance and inclusion of people with Down syndrome with the National Down Syndrome Society! What a great article! My step sister has DS & she’s in her 40’s. My father always gave her lots of love & made sure she was always included in everything they did. When she was a teen she had 2 jobs after graduating from high school. I didn’t even have 1 when I graduated! I learned so much from reading this, such as that the age has gone up to 60 for their life expectancy & also about the 3:21, I don’t know why I could never remember this! Thanks!